The ACP shall have a waistband with clean finished ends with seven belt loops, hook/loop adjustment tabs, and button/buttonhole closure. The pants shall have a covered fly with three buttons and buttonhole closure for larger sizes. 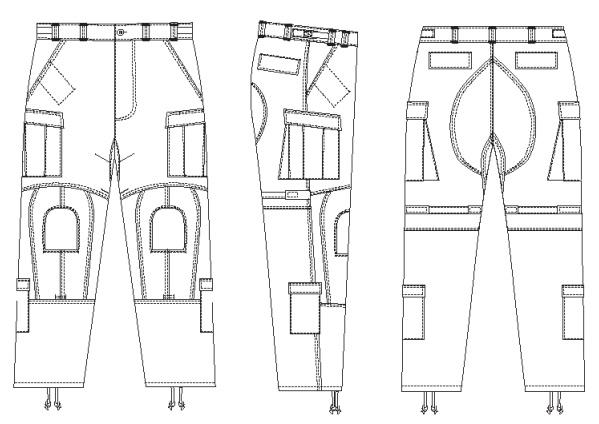 The pants shall have two side hanging pockets, two back single welt hip pockets with two button closure flaps, two front side pleated cargo pockets with three button/two buttonhole closure flaps and two lower leg pockets with hook and loop closure flaps. The cargo pockets shall have an elastic draw cord with barrel locks at the top hem. Both cargo pockets and lower leg pocket shall have sewn-in eyelets at the bottom of the bellows. The pants shall have a double needle seat patch, and a knee pad pocket on each leg and drawstring at each leg bottom. The knee pad pocket shall have a closure flap with hook/loop fasteners for use when the knee pad is not inserted. The pant shall have vertical and horizontal knee pad adjustments. The basic material for the pant shall be a Flame Resistant (FR) twill cloth in Operation Enduring Freedom Camouflage Pattern (OCP) or other pattern as specified in a solicitation or contract, conforming to the physical requirements specified for Type IV of GL/PD 07-12.